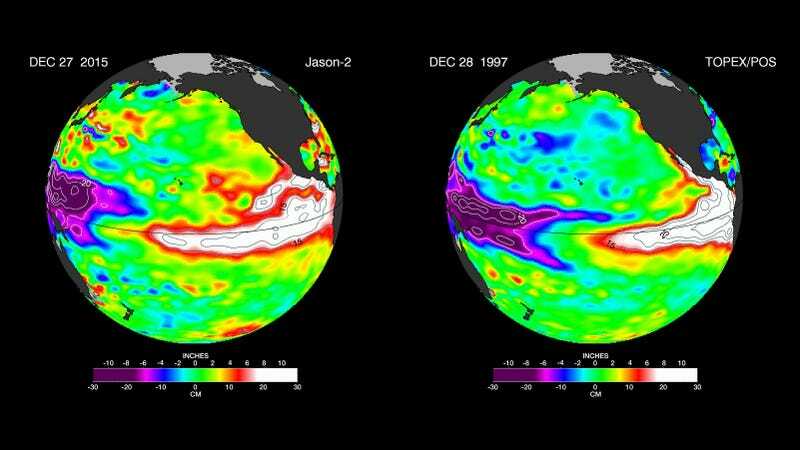 What will our El Niño weather look like in 2016? The answer is chaotic, powerful—and perhaps oddly recognizable. The comparisons between the ‘97-’98 El Niño and the 2015-16 El Niños has been steadily stacking up for awhile now. The first lookalike comparison that drew attention was ‘97 and 2015, but researchers were still cautious about reading too much in to the comparison. This latest data of sea surface heights from NASA JPL, however, shows even more similarities setting up between right around the beginnings of ‘98 and 2016. This is particularly important because in the 1997-98 El Niño, which the 2015-16 El Niño seems to be mirroring closely, early ‘98 was when we saw the worst and most powerful El Niño weather patterns: intense ice and snow storms, flooding, even some unlikely tornado landings. NASA notes that in addition to the close comparison with eighteen years ago, there’s also no other signs that El Niño has peaked yet—for that, we’ll have to look to 2016, which will most likely look quite a bit like 1998.